Early in March I told you all about the Rogers Smart Home contest, well it’s ending soon so I wanted to remind all of my readers in Ontario to enter! 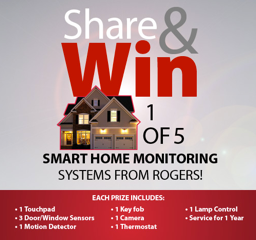 Why not go enter the Rogers Smart Home Monitoring contest, you could be one of 5 Ontario residents who are going to win this great prize. Enter and share with your family and friends. The more you share, the better your chances are of winning. I would love it if one of my readers won one of these prizes. Contest Period: starts at midnight on March 1st, 2012 and continues until 5:00pm EST on May 16th, 2012 the “Contest Closing Date”. Disclaimer: Sober Julie Doing Life is not responsible for any changes Rogers may make, choosing the winner or shipping this prize. We have been hired by a marketing company on behalf of Rogers Smart Home to share this contest with you.